A crofting township two miles west from John o’ Groat’s, situated at the foot of the Mool Hill. Bordered on the west side by the burn of Huna, and on the east side by the Ness of Huna, a small crest–like peninsula which terminates in a beach. On Huna links are the remains of a Picts’ village and several burial cairns. It is supposed to be the burial place of earl HlQðver , who, the saga states, was buried at HQfn in Katanes, about 975. The haven of Huna is a sandy beach. O.N. 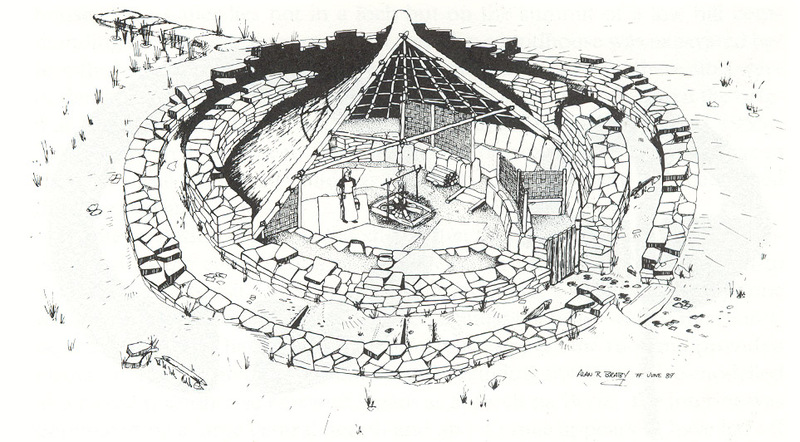 hQfn > ham in Orkney and Shetland, and there is a Ham in Dunnet adjoining an earth-house. Myrkkol, now Murkle, where HlQðver’s brother, earl Arnfinnr, lived, is much nearer Ham than Huna. In Caithness charter, 1574 , Hwnaye; 1777 Houna. Cf. Huney in Shetland, O.N. Húna-ey, the island of a man Húni. O.N. *Húna-á, the burn of Húni. Cosmo Innes in Orig. Par. Scot. suggested, “Huna appears to be the Hofn where earl Hlodver was buried” – a suggestion which apparently arose from an impossible derivation. John o’ Groat (Jan de Grot) ran a ferry from Huna to Orkney c1500 and a mail service between Huna and South Ronaldsay began in 1819. Over the last 2000 years Huna has been owned as a part of the greater area of Caithness under wider ownership such as the Pictish Kingdoms and later the Estates of Mey. The possibility of individual ownership of land and property within Huna and nearby townships didn’t occur until 1952 when the estates of Mey were broken up and sold by Captain Fredrick Bouhier Imbert-Terry, including the sale of individual crofts within Huna.